Whenever there’s a change of season, I love to update the styling in my home. 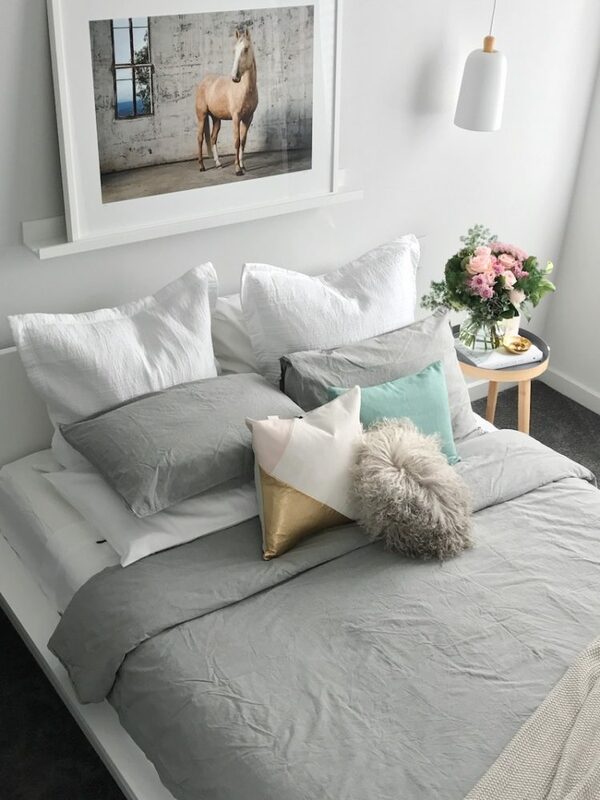 With the cooler weather starting to set in, I wanted to give my guest bedroom a warm relaxed luxe feel and have achieved this look with bamboo sheets from Canningvale. This is the first time I’ve used bamboo sheets and to say I’m addicted is an understatement – they have the lovely organic appearance of vintage linen but a much smoother, feathery softness. Anyone who suffers from sensitive skin should definitely give these a go. Not to mention they just look damn gorgeous! Check out this quick video to see how the look came together and scroll down for more pics and tips! I love this new colour combination of mid-grey, washed out green and blush pink so I selected this grey quilt cover set and paired it with a trio of feature cushions that pick up the green, accent pink and grey tones. I injected a good dose of white (fitted sheet, Euro cushions and on the leather cushion) to balance the look. You might like to keep a more monochromatic colour scheme of just grey and white, or try some different accent colours like navy and blush pink which would also look great. A luxe look is all about layers and texture. The bamboo sheets have a beautiful sheen and lustre that ooze with sophistication. Team these sheets with some feature cushions in different materials – we used a leather splice cushion, green linen cushion and round lamb fur cushion – and a throw rug to complete the look. You don’t need to go overboard here but a hint of brass, gold or other metallic accent can catch the eye and signal luxury. We used a small amount on a feature cushion and on the side table. 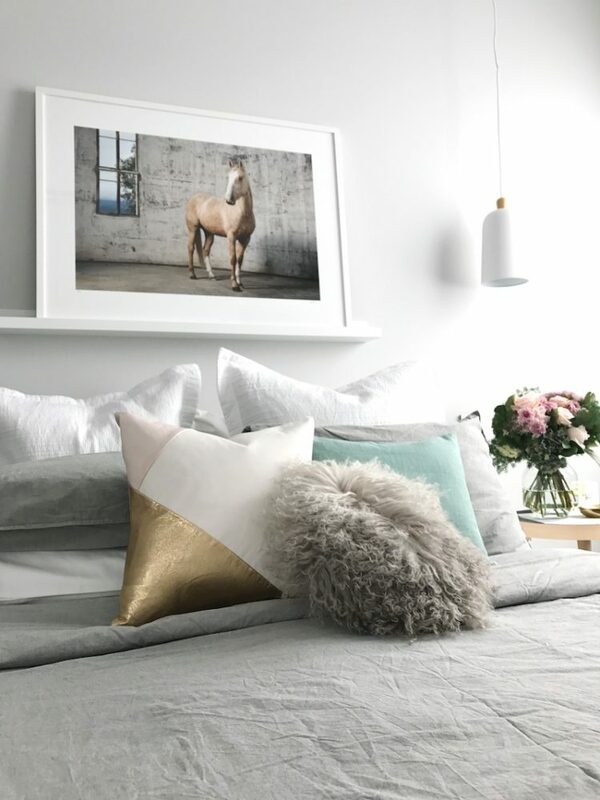 The shiny coat of the horse in the photographic print by Grace Costa also has a slightly bronzed sheen that works in this space. You might also like to check out our video about how to style your bed like a pro which shows exactly how we like to arrange cushions and includes more bed styling tips and tricks. 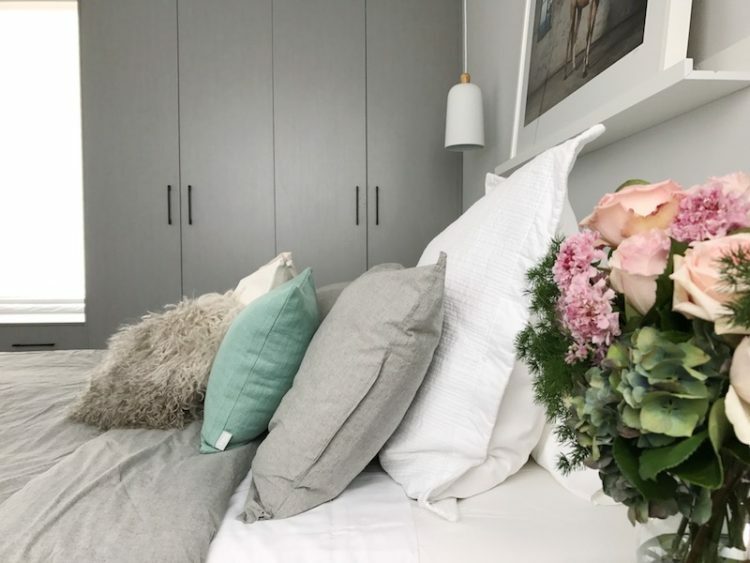 If you’re looking for high quality bedding that will last for years, check out the range of fitted sheets and quilt sets on the Canningvale website. Previous articleMy bathroom mistakes to avoid! Ohhhhh just love this bedroom.Gorgeous colours and styling as always!